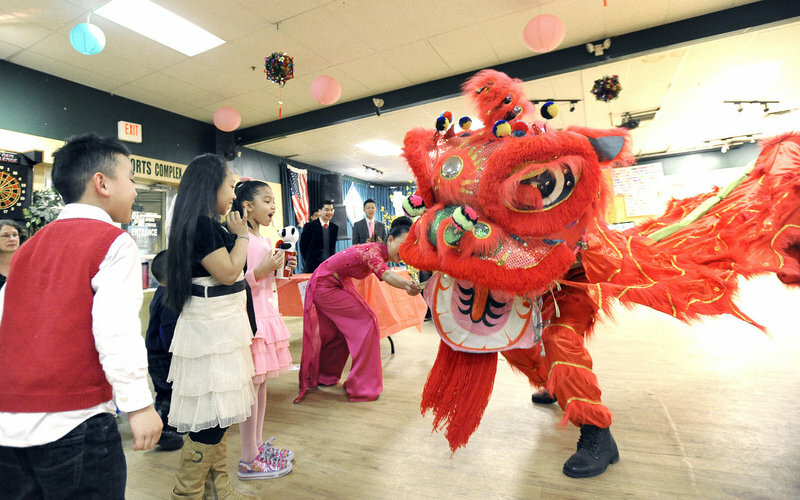 Hundreds celebrate the lunar new year in Portland ahead of the actual holiday Feb. 10. PORTLAND – It takes a certain dexterity, as well as lifelong experience, to maneuver a piece of dried elbow macaroni down a table using chopsticks. That may be why business was slow at the chopstick game at the Vietnamese American Association of Maine’s lunar new year celebration on Saturday. 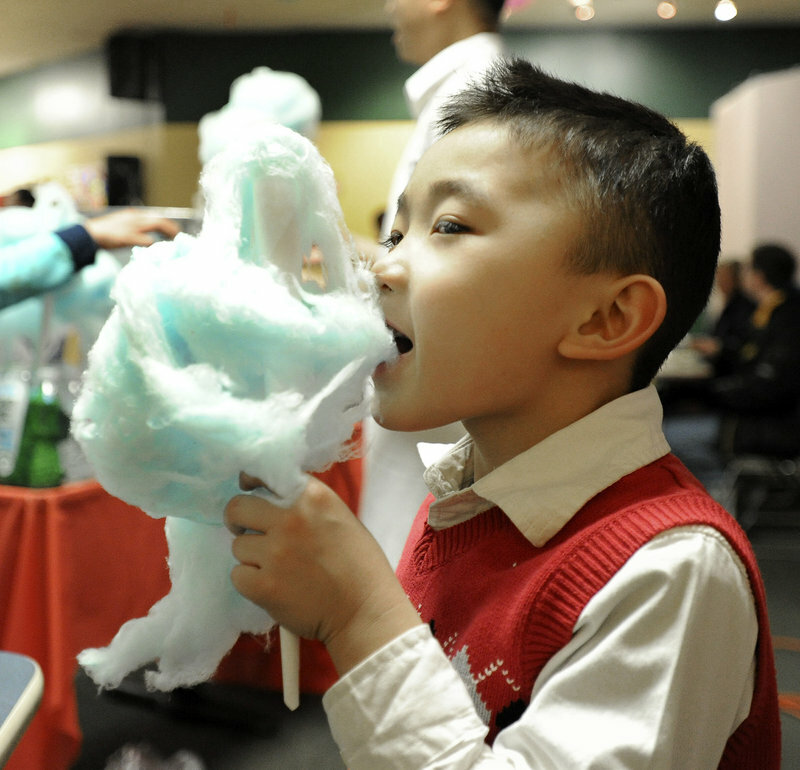 Ayden Tran, 5, enjoys cotton candy while celebrating the Vietnamese lunar new year in Portland on Saturday. 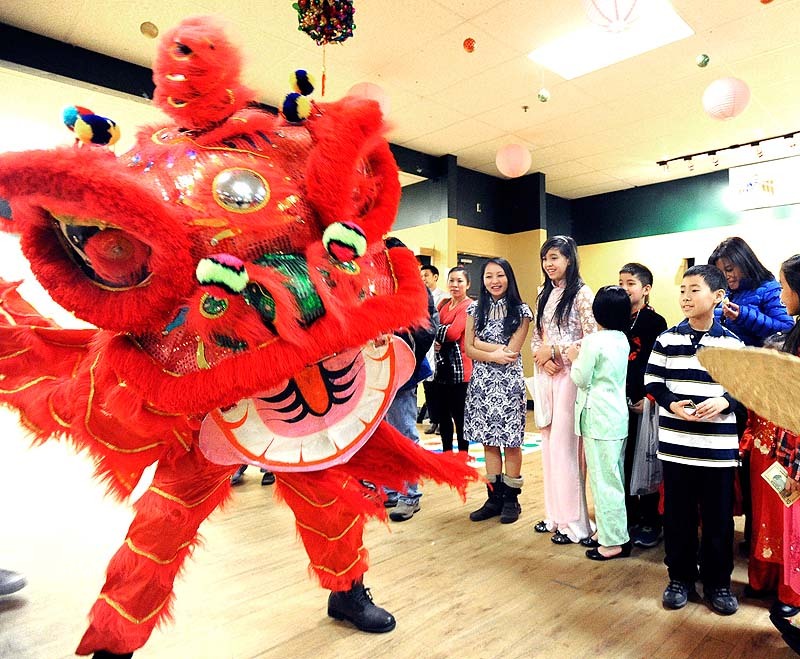 Children enjoy the dragon dance during the celebration of the Lunar New Year by the Vietnamese American Association of Maine at The Gold Room & Turf's in Portland on Saturday. Even Thanh Nguyen, 12, of Saco considered the chopstick expert by her friends, Jennie Ta, 16, and Jennifer Chau, 11, both of Saco, who were all helping to run the game, said the game was extremely difficult. “I can’t even get one,” said Thanh. The chopstick game was among the children’s activities featured at the celebration of the Vietnamese new year, known as Tet, at The Gold Room & Turf’s in Portland. The association, which has hosted the event for the past four years, scheduled the celebration a week before the actual holiday, which falls on Feb. 10, because the first three days of the holiday are traditionally spent with family members at home. “It is a time to have a family reunion, spending the first three days with family and the next four with distant family and friends,” said Anh Thu Truong, secretary of the association. Vinh Le, director of the association, said that people from Maine travel 30 hours to Vietnam in the season when airplane tickets are the most expensive, in order to observe the holiday with their family members who still live there. Le has made the trip three times. “We want to go back and experience the traditional Tet,” he said. Maine’s Vietnamese population is tiny, estimated by the association at about 7,000. The population was estimated at 1.7 million nationwide in the 2010 U.S. Census. Many of them are Amerasians who were allowed into the country by the 1989 American Homecoming Act or who sought refuge in the United States following the Vietnam War after fleeing the Communist-controlled country by boat. But what Maine’s Vietnamese may lack in numbers, they made up for in enthusiasm at Saturday’s celebration. Hundreds of people turned out for the free children’s program in the afternoon, before a dance and fashion show at night. Children donned traditional Vietnamese dress and watched a dragon dance. They dined on sweets, such as watermelon soup and sweet potato, and savory sticky rice with yellow mung beans and clay-pot pork and eggs. They competed to be named best dressed. The children also cashed in the chips they won at the game tables for one of the hundreds of toy prizes. Christine Le, 18, who moved from Vietnam two years ago to study at Thornton Academy in Saco, where she is a senior, said the association’s event helped stave off homesickness. “I didn’t expect to have a Tet here,” she said.